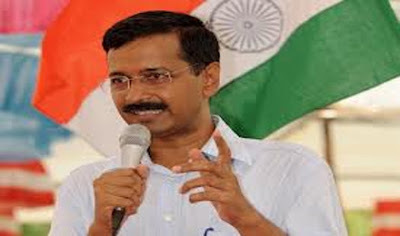 NEW DELHI: India Against Corruption (IAC) activist Arvind Kejriwal has targeted BJP president Nitin Gadkari in his next expose in connection with the irrigation scam in Maharashtra alleging Gadkari was illegally favoured by the state govt in allocation of farm land. IAC alleged a conflict of interest between Maharashtra farmers and Nitin Gadkari's businesses. During the press conference, Kejriwal accused Gadkari of corruption in the construction of dams. Reiterating Anjali Damania's charge, Kejriwal said the BJP president's business interests were flourishing at the cost of farmers and questioned,"whose interests does Nitin Gadkari represent? Is Nitin Gadkari a businessman or a politician?" Nitin Gadkari had taken 100 crore acre of land in the name of an NGO at Wardha in Maharashtra, which had only one room and only one woman worked, Arvind Kejriwal said. He claimed Gadkari had several companies including five power plants, agro-based companies, solar based companies, construction companies, fertilizer, sugar company - Mahatma Sugar company, Prem Gana Sugar company. He said farmers had been threatened by Gadkari's men and excess land had not been returned to the farmers. Meanwhile, top BJP leaders like Sushma Swaraj and Prakash Javadekar had reached Nitin Gadkari's residence. BJP will counter allegations at a press conference at 6.30pm. IAC has been going after the top guns of both the national parties, BJP and Congress, by exposing a series of scams. Robert Vadra, son-in-law of Congress president Sonia Gandhi, was the first one to be hit with charges of suspicious deals with the leading construction firm, DLF. "What we have exposed about Vadra is just the tip of the iceberg. There are multiple documents in our possession that will pin down Vadra and in time we shall reveal everything," said Gandhi. Next in IAC's firing line was law minister Salman Khurshid and his wife, Louise, for alleged financial mismanagement by their NGO, Dr Zakir Hussain Memorial Trust. A media channel too during the same period conducted a sting operation on Khurshid's NGO which showed financial benefit never reached the beneficiaries. "Khurshid's NGO issue basically fell into our lap during that time and many more shall come," said Gandhi.